Handmade Modern Wood Necklace from Africa, "Endless Love"
"When I was a little boy, my grandmother asked us, 'What does love look like?' My little sister replied, 'Love does not end or fade.' That question inspired this design," Robert Aidoo-Taylor says. 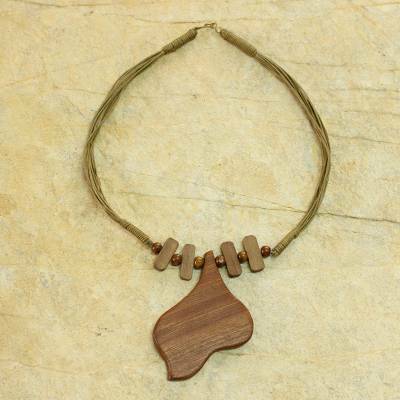 He works in sleek African oprono wood to craft this necklace, presenting the pendants and beads on linen cords. You can find wood pendant necklace 'Endless Love' by Robert Aidoo-Taylor in jewelry categories such as Eco-Friendly Necklaces, No Stone Necklaces, Wood Necklaces, Linen Necklaces, Brass Necklaces and Pendant Necklaces. Enjoy exploring these sections for other Novica treasures.